Achieving user adoption goals for enterprise software can be challenging. Many enterprises are seeing their traditional user bases erode as millennials make up more of their user population and the software is seen as too hard to use or not valuable. Some enterprise products never seem to initially engage audiences enough to quite get off the ground. We’ve worked with enterprises around the globe from the Fortune 50 to early-stage ventures to measure and improve user adoption of many enterprise software products. Below is a checklist of things you can do to properly diagnose some common challenges with enterprise user audiences and move the needle on user adoption. 1) Enterprise users are different. Understand what makes them tick. Enterprise users are different and commonly fall into two categories: 1) domain or subject matter experts who use technology in a mission critical manner as part of their job or 2) enthusiast end-users who have some level of domain expertise, but use technology in a less mission critical manner. For example, an enthusiast user might utilize a stock trading platform heavily, although she isn’t a professional trader. Both user groups bring bring a ton of experience and expertise to bear on the technology. What typically gets domain expert users excited about adopting technology is high utility or the usefulness of new technology over other methods. After usefulness is addressed, then the software also needs to be easy to use. 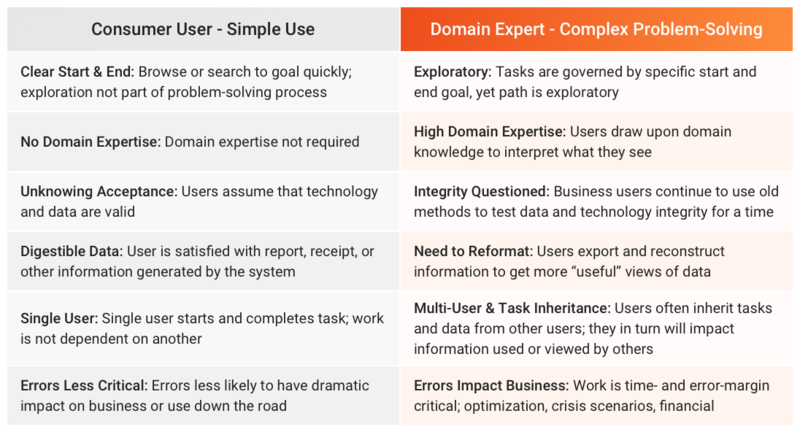 The table below compares the common behavioral differences between consumer and domain expert end users. 2) Know your real competition. With domain expert users your competition isn’t always obvious. Domain experts can go very far with their instincts, Excel and a whiteboard. Often the real decision is whether to invest in software at all or stick with a solution cobbled together in-house. So, your software better impress. Providing a new insight, simplifying a calculation or optimizing a complicated process to take a task from days to hours gets these folks excited. Don’t assume that simply upgrading your UI to Bootstrap and slapping on an ill-conceived dashboard will make domain experts engage. For these users, beauty isn’t skin deep. Check out our related post on how User Experience Isn’t Graphic Design. 3) Recognize user expectation is increasing. Gone are the days when people use or endorse software in the workplace because the business mandates they use it. For millennial and non-millennial audiences, user expectation is on the upswing. Users have great experiences with personal technology and websites outside the workplace. Consequently, fair or not, your domain expert users are comparing your enterprise software application to their iPhone. They are seeking similar greatness at work. Enterprise users will seize the opportunity to influence purchases of high value software or unsubscribe from low-value, hard-to-use software. 4) Stop using B2C analytic tactics with B2B software. User analytics are both great and terribly misleading. It’s easy to make the wrong assumptions about why a user segment is exiting your software or not using a particular feature. Don’t infer the meaning behind analytics. Go to the source and ask users what would make the software better at the particular point of exit. As obvious as this sounds, product teams consume analytics and try to guess at user behavior all the time. This wastes a lot of time and unnecessarily increases risk. Instead use analytics as a starting point to narrow the investigation. Interview small numbers of users to investigate the behavior behind the analytic. Even just five users per persona is usually enough to spot a trend. 5) Don’t fall victim to no start path. If you don’t have any analytics behind your technology to know what’s happening or are running into adoption challenges with new software, it’s possible that many of your users are simply never getting started. With sophisticated technology and domains, it’s easy to get mired in the details. If users never start, the details don’t matter. Software that gets traction with enterprise users typically does a few things really well with instant gratification upon first use. While it may take several minutes or even hours for a user to complete a larger task, there should be some initial quick wins carved out in the process to ensure the user feels successful and will want to return. For example, allow the user to successfully import some data, locate and view an existing outcome, or perform a smaller portion of a larger task. Has your user audience left the building? Many products that previously had great adoption are losing their luster with millennials as veteran users retire and leave the workforce. Millennials expect enterprise software to be just as easy and fun to use as social media and other technology on which they rely. They also typically expect software to run in some form across all of their devices, mobile, tablet and desktop. Recognize if your user audience has changed and investigate new expectations that may differ from old hat. This last tip is groundbreaking: set “measurable” goals for user adoption. In all seriousness, what defines successful user engagement for enterprise software can vary wildly. Common consumer focused metrics such as frequency of use, number of outcomes generated, or amount of data stored in the system can lead to a false sense of accuracy in enterprise. While these metrics may be applicable for some user audiences, measuring success in other situations could prove more difficult. For example, frequency alone could not be used to measure the adoption of mission critical software that is only applicable when failure has occurred, or retail software that has a cyclic nature and is used more heavily from November through January. 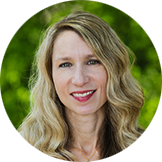 Instead create new measures that are more indicative of the value that your software provides and can truly serve as a barometer for success or failure. For example, rather than user login frequency, try the number of system-wide failures averted or time to adapt to a shift in the supply chain.